I notice a rather interesting door that appears much like a watertight door on a ship on this and other Japanese lighthouses of this design and what appears to be portholes for tower windows. Maybe these towers were designed by a naval architect. I thought that was a little odd when I was there. That one is an interesting tower -- almost looks like a "modular" unit quickly built up. I have no idea if there was ever a keeper's dwelling with it. There were some houses a few hundred feet away, but nothing too close. WW2 tie-in: The submarine USS Pickerel was apparently sunk within view of this lighthouse by a ASM attack (can't remember if it was aircraft or naval units -- I think it was aircraft). 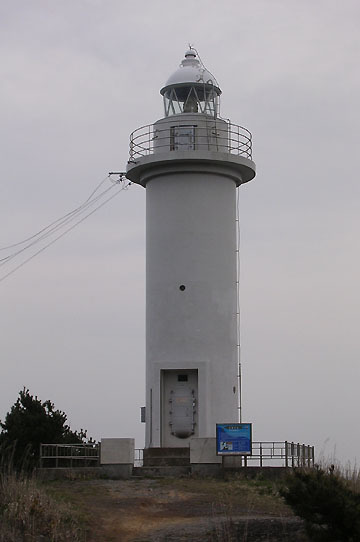 The other lighthouse (Shiriya) sits at a shipping choke-point (entrance to the Tsugaru Strait) and was attacked by the carrier-based aircraft of TF54 in July of 1945. In that attack the lighthouse was badly damaged and two? of the keepers were killed. Regarding bombing of Shiriya, it was targeted for being the location of a radar/radio installation. The submarine Cero (SS-225) had lifeguard and picket duty off Honshu for her eighth war patrol. On 15 July, she rescued three survivors of a downed bomber, and later that day bombarded using deck gun the Japanese lighthouse and radio station. In searching for more information I found these great videos of the Shiriya lighthouse.